with the divinity within after rising above body-consciousness. This sublime principle differentiates the holy path from all other schools of thought. unitl you see that He is the Doer, and not yourslef. What is meditation, where to meditate, how to meditate, and who helps us to meditate? It is said that the seat of the soul is here between and behind the eye-brows. But how can we transcend there? 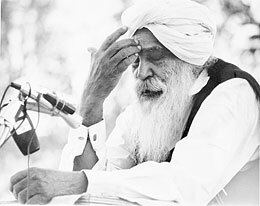 Sant Kirpal Singh: Truth in the teachings of the Masters is a definite science. It is called Word or Naam. It has a practical aspect. It is universal and for all mankind. It is the natural way back to God achieved during lifetime. It is a process of self-analysis and self-introspection in which first-hand experience is given by the Master individually or in a class by opening the inner vision to the Light within, called the Light of God and a contact with Sound or the audible life stream or the voice of God at the time of initiation, more or less according to each man’s receptivity and background. The disciple must then develop it further by allotting time regularly each day with love and devotion.